Shakeout In The Brewing Industry. Since the end of World War II, the American brewing industry has been undergoing a radical "shakeout" -- that is, the strong have gotten stronger and the weak have died off. Also, note the widening disparity in barrelage between the No. 1 brewer and No. 10 brewer over the decades. In 1950, the gap between No. 1 and No. 10 was a mere 3.5 million barrels; by 1980, the disparity had grown to more than 46 million barrels. (In 1997, the gap was over 90 million barrels). Finally, in looking at the list of Top 10 brewers in 1980, note that only five of the companies are still operating independently today. The others have either closed or been absorbed by their larger competitors. **Note: One barrel equals exactly 31 gallons of beer. Total Barrelage of All U.S. Brewers in 1950: 82,830,137 barrels. Top 10 Brewers' Percentage of Total U.S. Barrelage: 38 percent. Total Barrelage Of All U.S. Brewers in 1960: 87,912,847 barrels. Top 10 Brewers' Percentage of Total U.S. Barrelage: 52 percent. Total Barrelage Of All U.S. Brewers in 1970: 121,861,000 barrels. Top 10 Brewers' Percentage of Total U.S. Barrelage: 69 percent. Total Barrelage Of All U.S. Brewers in 1980: 176,311,699 barrels. 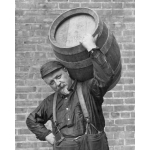 Top 10 Brewers' Percentage of Total U.S. Barrelage: 93 percent.